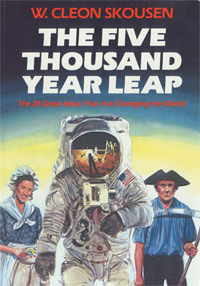 The Five Thousand Year Leap: Twenty-Eight Great Ideas That Are Changing the World is a book that was published in 1981 by US author W. Cleon Skousen. The book asserts that the United States prospered because it was established upon universal natural law principles that had been passed down from common law and traditional Judeo-Christian morality, as many of the Founding Fathers had been guided by the Bible, among others. Thus, U.S. Constitution incorporates enlightened ideas. Ronald Mann's introduction to the 10th-anniversary edition praises Skousen for grasping the country for choosing "Christ or Chaos" and for acknowledging that its future depends on "accepting and demonstrating God's government." Either proposition would have astounded James Madison, often described as the guiding spirit behind the Constitution, who rejected state-established religions and, like Alexander Hamilton, proposed a central government so strong that it could veto state laws. Wilentz acknowledges that the Founding Fathers rejected what Samuel Adams denounced as "utopian schemes of leveling," but he notes that some of the Founding Fathers were quite pragmatic when it came to policy specifics. This page was last edited on 27 August 2018, at 22:56 (UTC).